So I just finished lashing together and test firing my coilgun, I’ve tested it with 400V at 4800uF using a nice sized coil. For now its experimental, however I may add more windings or simply just increase the capacitor bank size. 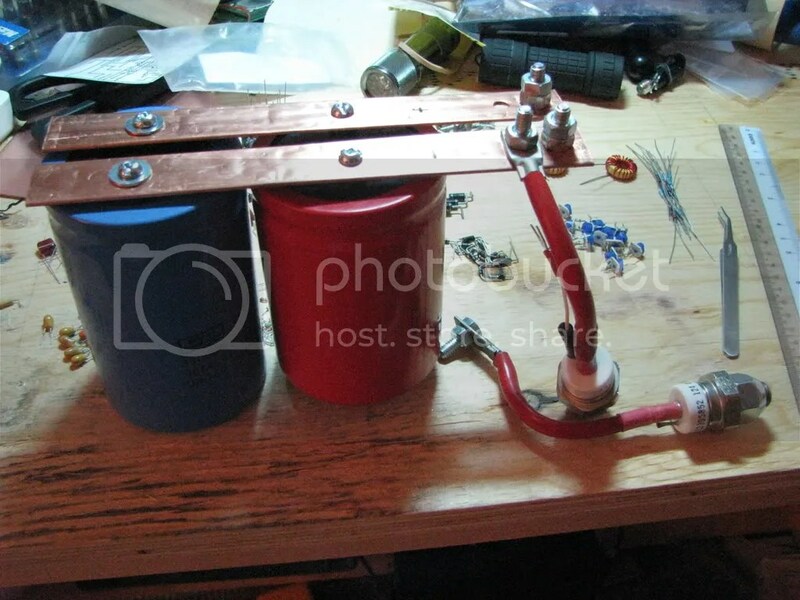 At the moment, the coil (18AWG 32 windings x 4 layers) heats up after a few firings and is connected to the capacitor bank which has been tested up to 400V. 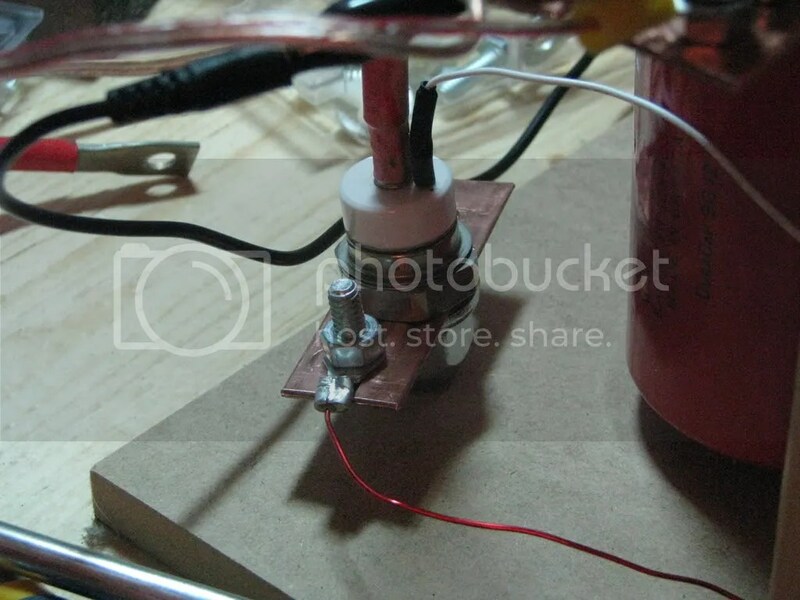 The firing circuit is simply a 9V battery, a 82ohm resistor and a pushbutton switch connected to the SCR. The charging circuit is connected directly to the charging circuit, however I should have a DPST or DPDT switch to physically disconnect the bank from the charger. The SCR is mounted onto a short flattened copper pipe with 2 other holes for mounting. 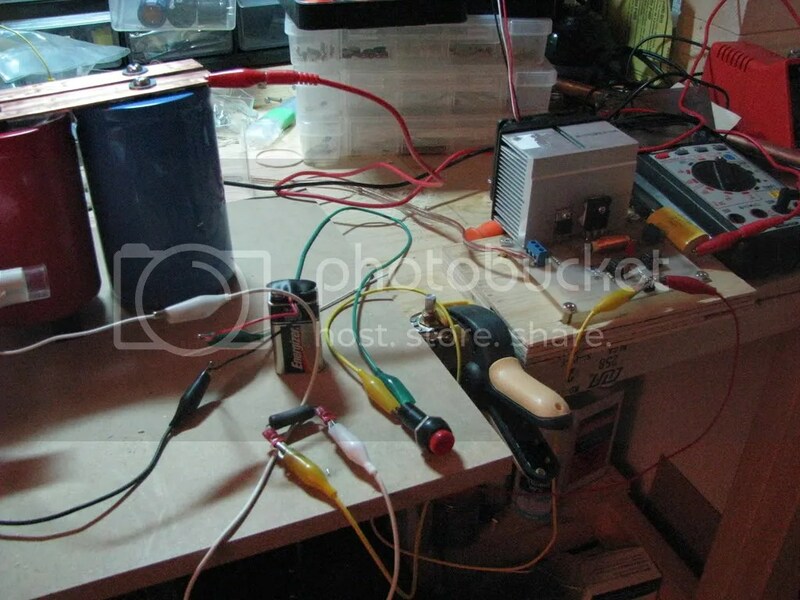 My next step is to build a much larger bank of 200V or 300V capacitors as they are more available to me. Using bigger SCRs or multiple paralleled SCRs may be an option to increase pulse current and faster charging can be obtained via directly rectifying AC mains. 200V or 300V capacitors are usually used when 120VAC is rectified to 170VDC, thus they are more commonly available. Energy is obtained via the formula E=0.5CV^2, since C = 4.8×10^-3 and V=400, E=384J, however by decreasing voltage to 200V, E drops to 96J and in order to obtain the same energy, capacitance must nearly triple. Substituting a 400V cap bank for 200V is a fairly poor choice, however some coilguns have been designed so well that efficiency is good. Losses in this particular coilgun are in the projectile shape/size sticking in the barrel at times, and also likely back-EMF losses. Ok so a few people have been wondering just what I’ve been up to recently so here’s the list! 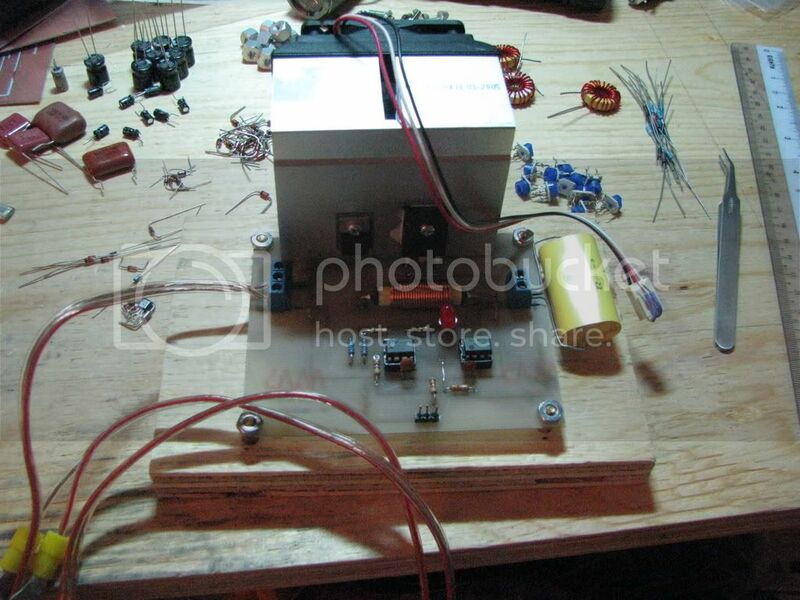 First I worked on the secondary coil of my mini SSTC, then I decided to make a 450V boost converter based off of Uzzor’s 450V boost converter with a few improvements. 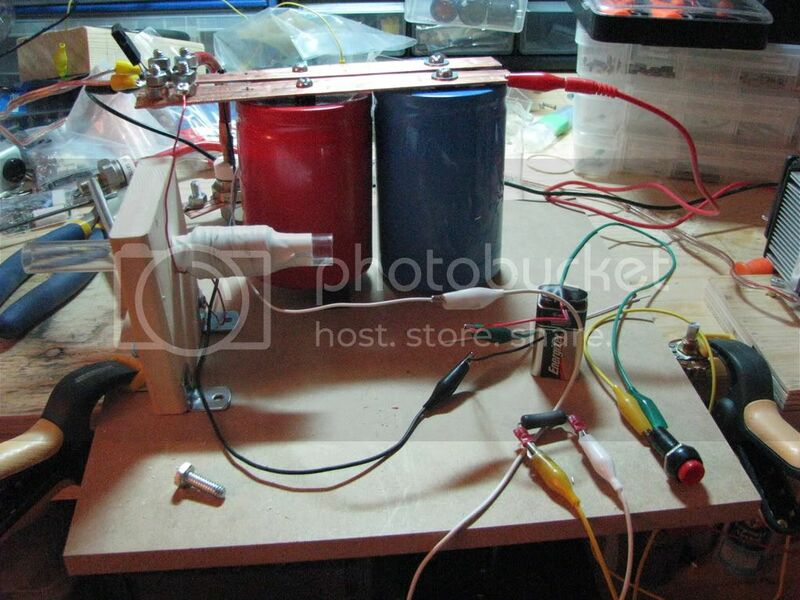 The 450V boost converter is a 555 based boost converter and when powered with 12V at 3A can charge ~5000uF in 1-2 minutes and seems fairly efficient. I decided to give both the IRFP450 and the diode heatsinking, so I isolated the diode (tab is equivalent to HV +) allowing the heatsink itself to stay at 12V when the charger is running. When I’ve finished tweaking it, I will publish the information, schematics and PCB images, but I may have to redesign the PCB so beware when trying to duplicate the design (there are 2 errors greenwired underneeth the PCB). After I built the charger I assembled my mini cap bank from the only 450V capacitors I could obtain at the time; 200V capacitors appear to be much more available at a industrial surplus store so I may eventually try building a charger for lower voltages. The copper buss bars are made using 1/2″ copper water pipe flattened in a vise, giving a fairly satisfactory result (others have sworn by using a hammer + wood block, however some have said that the hammer method gives them curved buss bars). The SCRs are stud mounted ‘mystery’ SCRs I picked up for $5 and the SCR will allow lossless switching (compared to other amateur coilguns). 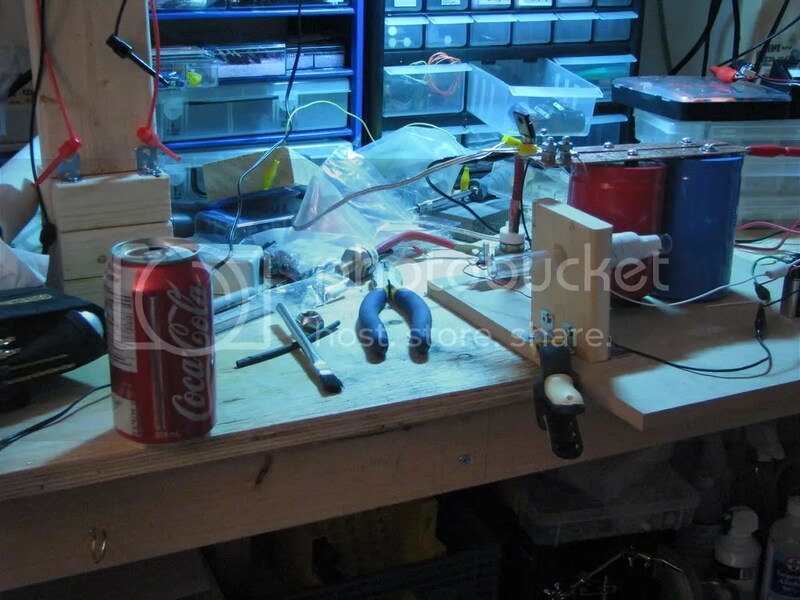 I’ve also been busy expanding the storage on my workbench and squirreling away parts before the school year begins and I’m inundated with too many other things to clean the bench up (Before and After photos follow). 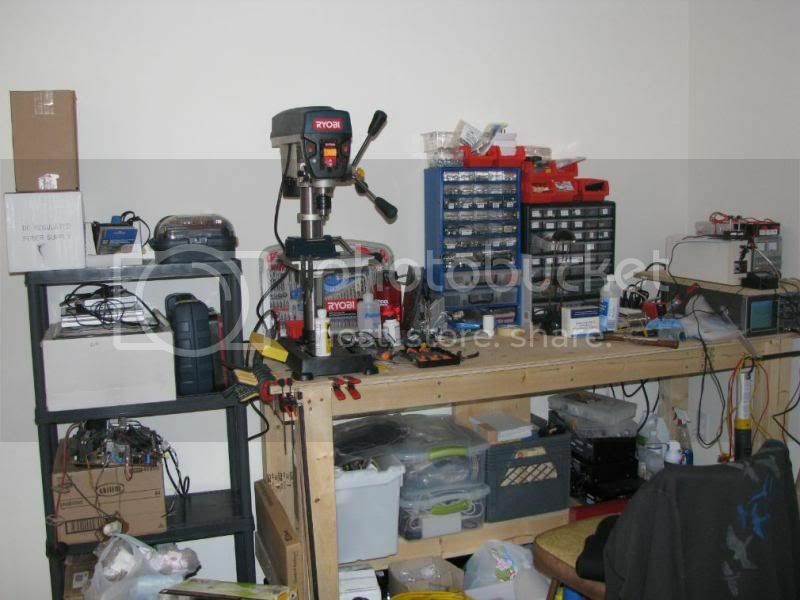 In my frenzy of obtaining parts for projects, I have ordered from Electronics Goldmine and a company called ‘Futurlec’. 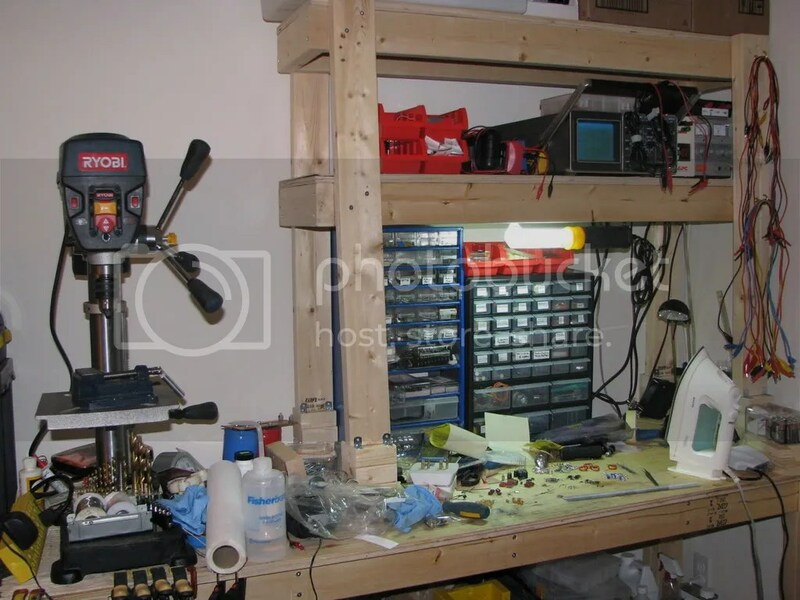 I recommend Electronics Goldmine however I seem to be getting a bad customer experience from these guys so if/when I receive my goods I’ll do a writeup reviewing their quality/performance. All that is left is a Digikey order for those ‘hard to get’ things like specific resistors, inductors, sil-pads and nylon washers. 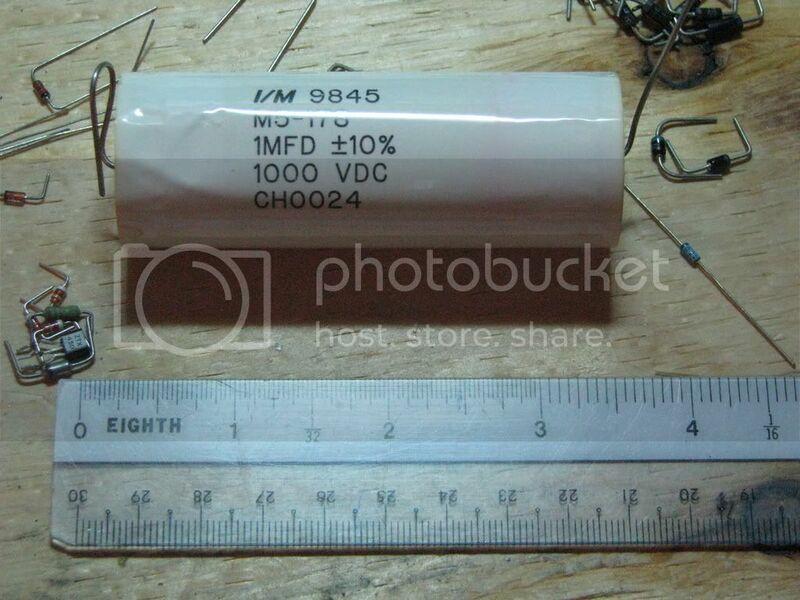 From Electronics Goldmine, I ordered some torroids for gate drive transformers, a bunch of 0.1uF ceramic mono-caps, 4 big 1000V 1uF polypropylene capacitors (for tank caps), and an assortment of capacitors, inductors, diodes and other bits. From Electronics Goldmine, the ‘Gold Pack’ category is all just parts assortments with even $3 boxes of ‘everything’ which are really tempting for my next order from them in the future. 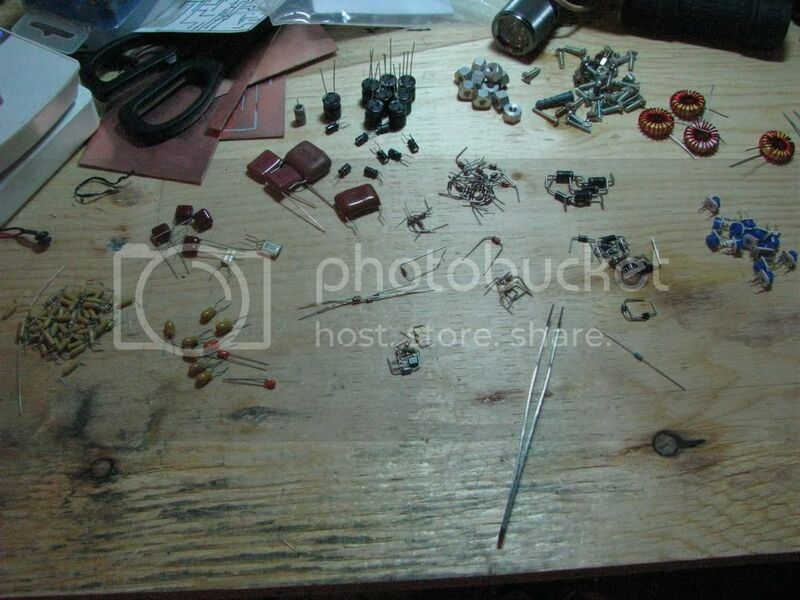 Below is the ‘Gold Pack 7‘, and I was lucky enough to get 4 matching inductors, a boatload of 1uF tantalum caps, some poly caps, trim pots, diodes, electrolytic caps, and some possible ‘precision’ resistors. A little dissapointing was the ‘watering down’ of the pack with extra screws and nuts. For international shipping, the size/weight of the screws may affect shipping to some countries. Among the other cool shots, the 1uF 1000V polypropylene caps that I’m testing for tank caps. While they won’t be any CDE 942c’s, they have no datasheet and on my mini SSTC could even have breakthrough and fail [catastrophically]. 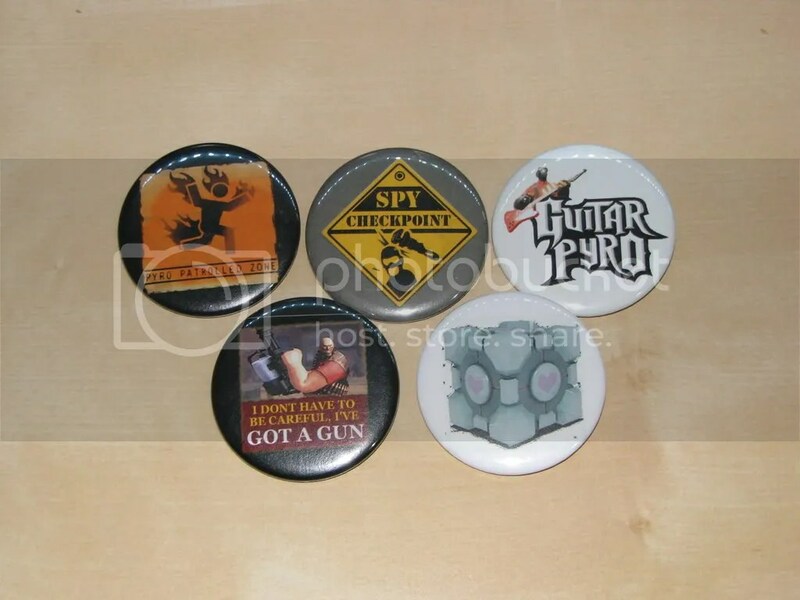 It could be entertaining, or expensive, but at $2 a piece I couldn’t resist. Last but not least with all the squirreling away of parts I would like to thank ST Micro for sampling some power semiconductors. I would take photos of my power semiconductor collection for giggles but my workbench is full of parts to be sorted to bins.